NRL and North QLD Cowboys star, Matt Bowen is in the country as the official guest for the annual Trukai Fun Run event tomorrow. “I always love coming to PNG and really appreciate the support shown by the people. It is always a great experience to be here in PNG and a privilege to be part of the Trukai Fun Run event,” says Bowen. North QLD Cowboys Community Manager, Mr Jeff Reibel who accompanied Bowen in this trip to PNG also echoed the same sentiments saying, the club always appreciate the support given by the PNG people given the fact of their strong relationship with Trukai Industries. 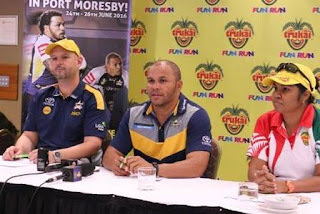 The Trukai Fun Run is expecting a huge crowd of over 40,000 to 50, 000 participants for the event in Port Moresby as well as other centres, and Bowen says he cannot wait to be part of the Fun Run to see especially young children taking part. “Obviously, the key message we are bringing across to children in the communities is to stay away from drugs and alcohol by eating well, playing safe and staying well to help build a safer and stronger community,” says Bowen.